At this beautiful vibrant mountain home you'll have the Colorado mountain vacation experience because our guests are eligible for complementary skiing and golf at Breckenridge, Keystone, Copper Mountain, Abasin, Vail and Beaver Creek. alpine environment, there are incredible views from every room and every window of this luxury 3-bedrooms, 2.5 bathrooms vacation home. The inviting and well equipped kitchen allows you to simmer soup on the island ceramic cook top while enjoying the magnificent views from the kitchen windows. The living room is a perfect place for relaxing after a day on the slopes, shopping , rafting, hiking , biking and sightseeing with comfy seating you'll melt into, a gas fireplace, a big screen TV and a top-notch sound stereo system. The bedrooms and bathrooms are full of creature comforts too, with heated floors and towel bars, quality linens and robes , and beautiful artwork and woodwork. Check out the reviews and book your Breckenridge vacation now at the Aspen Leaf House. • Fully equipped kitchen with stainless steel appliances. • DeLonghi coffee/espresso maker, 4 slice toaster, crockpot, Starbucks coffee press & all utensils. • LCD TV’s in all bedrooms, Bose surround system in master and Bose Ipod SoundDock in “Dream” bedroom. • High speed wireless internet access and FREE long distance telephone within U.S.
• Fully stocked pantry with paper and dry goods. • All linens and towels provided, and even plush robes and all laundry supplies. My family of 5 stayed for a week and had a wonderful vacation. The home is very comfortable, the views of Breckenridge are amazing - we got up early some mornings just to watch the mountain "wake-up." Everything in the home was first class. The beds were comfortable, the kitchen allowed us to make dinners after long days of skiing and the living room offered a great place to sit down, relax and play games. The hot tub was very nice after skiing all day. The drive to the base of the gondola was maybe 5-7 minutes every morning. The ski passes were a super bonus - just put them in a pocket in your jacket and head to the slopes. Saved us the need to buy 2 more passes and allowed those who wanted to ski more days the flexibility to do so without spending more money. Overall one of the best VRBO's we have ever stayed at. We try to get to Summit County each year and this will be the first place we check for availability the next time we head out. We had a fantastic time staying in the Aspen Leaf House. Everything was just perfect. The house is laid out nicely. Lots of nice areas for sitting and hanging out. The radiant heat system makes a huge difference in the humidity in the house. This is the first time I've come to Co. and didn't get a bloody nose. The ski passes are awesome too. We had someone staying in our party that hasn't skied in 15+ years. She got to go out for just a couple runs without having to pay for a full day lift ticket. Kevin and Monica are great hosts. Easy to work with and responsive. We love the house and can't wait to come back next year! Tucked back off of Main St. about 1.5miles is this amazing vaca home complete with all the cabine/wood vibe plus all the 21st centers amenities. Enjoyed every semiconductor of the stay and will without a doubt be back. I would rate this spot ++A no question. 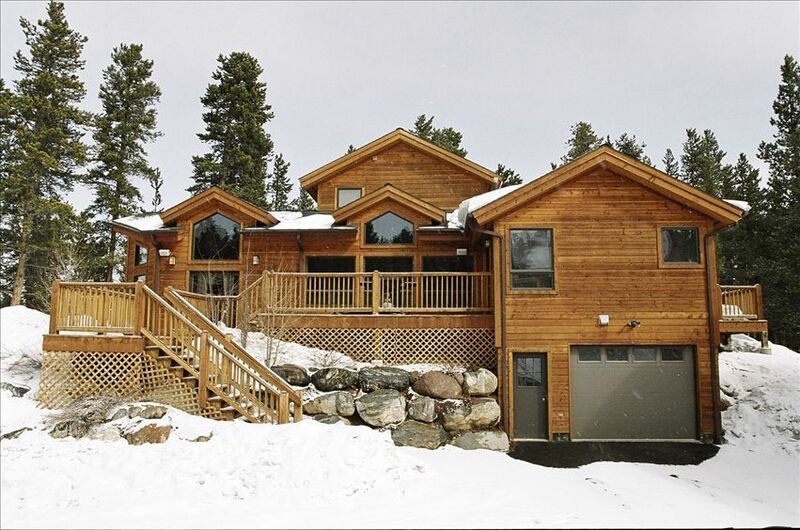 Love Breckenridge, this home is situated close to town, near trails. Would love to visit again. Thanks for staying with us and glad you enjoyed your stay. Happy Holidays and we hope to see you again next year. The home was really great and felt like a home from home. It was very well organised with all essentials available. The beds were comfy and the master suite superb! One of the neighbors called Tom was very helpful with tips on places to visit and we appreciated his care whilst we stayed in the house. I would recommend this home to all travellers whether for skiing or summer activities. This mountain home is special! The views were amazing and the owners have included every amenity imaginable. Downhill Skiing/Snowboarding, Snowshoeing, Sleigh Rides, Dog Sledding, Ice Skating, Spas, Restaurants (from sushi to fondue, pizza to Chinese), & that's just during the winter, During the summer enjoy Biking, Golf, Whitewater Rafting, Concerts, Festivals & so much more!